Hardy Zones 3-9 Mature Height: 10' Attracts Hummingbirds Very fragrant Immediate shipping in 2.5" pots. Dormant shipping in winter and early spring months. 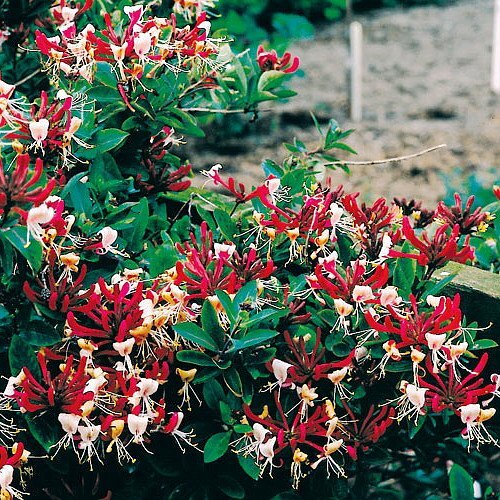 Much admired in Europe, this fine selection of the Late Dutch Honeysuckle impressed us tremendously at the Boskoop Trials in Holland. More compact and slower growing than the species and much earlier blooming, it produces an immense bounty of fragrant flowers from early summer well into frost. The crimson buds open to creamy white, yellow and dark red flowers, followed by translucent red fruit. Probably the most beautiful climber in the genus, it is excellent grown on trees, pergolas or fences, and ideal for screening. Hardy Zones 3-9. Mature Height: 10'.